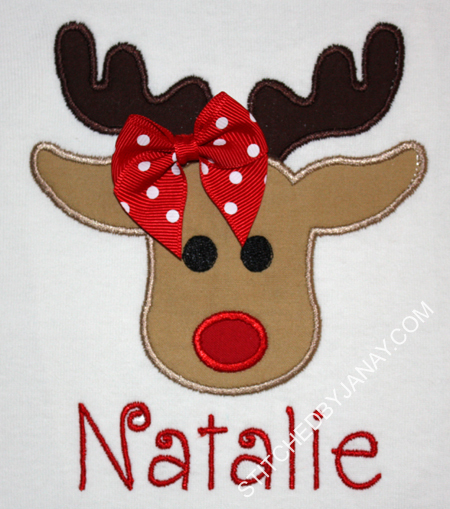 I used Lynnie Pinnie's Reindeer with Ornaments Applique, and added the text with Embird Alphabet #8. 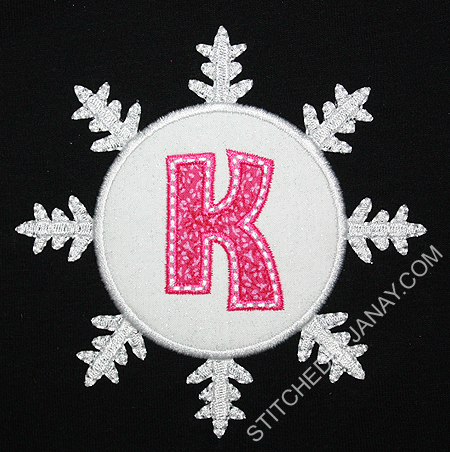 This is Planet Applique's Let it Snow 2 Alphabet. 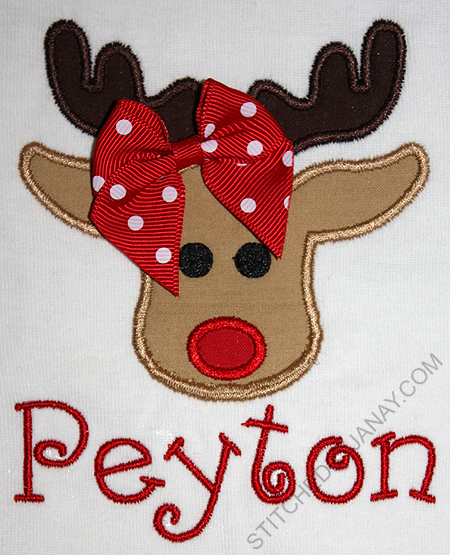 And for Peyton I used Applique Cafe's Rudolph 2, adding her name with Swirley from 8CP. Anxious to see these shirts in action! 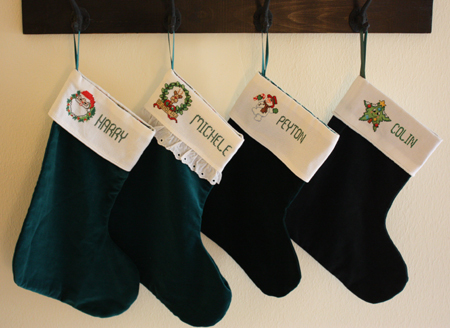 Of course, when did I complete the stocking?? Not until the Saturday before Thanksgiving... ah well, I doubt Michele would have hung it up before then anyway. 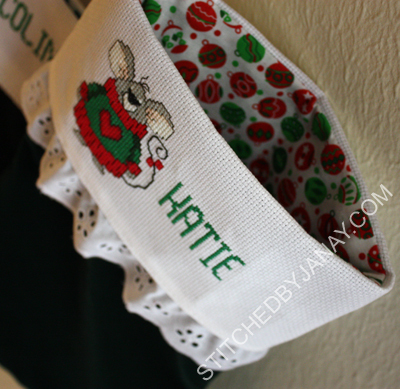 The beauty of these handmade stockings is they were made over the course of several years. 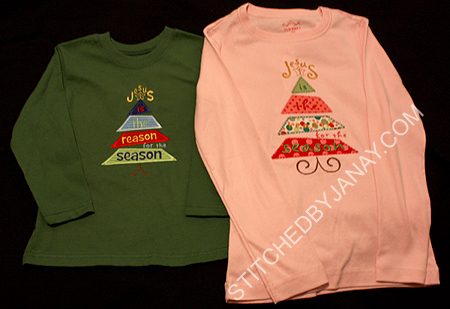 Harry and Michelle's were made at the same time -- they have the same green felt, same lining fabric and same size Aida cloth. Peyton and Colin's however have a slightly darker green velvet, a different sized Aida cloth, and one had a different trim around the edge. 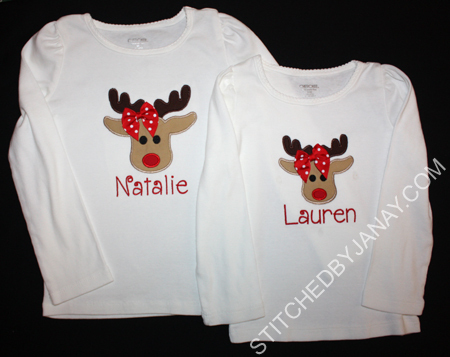 They all had different ribbon hangers and were slightly different shapes. When I saw that, I was relieved -- it alieviated the pressure to make something *exactly* the same. I can do cross-stitch, but I am WAY out of practice and have extremely limited supplies, so I enlisted the help of my friend Michelle. I'm pretty sure the weekend after I asked her to help she had already picked a design and stitched it. That was back in February. :) She was really on the ball, and did a fabulous job! Thanks, Michelle!! I found the same color velvet as the boys' stockings, lined it with something from my stash and added an eyelet ribbon similar to Michele's. 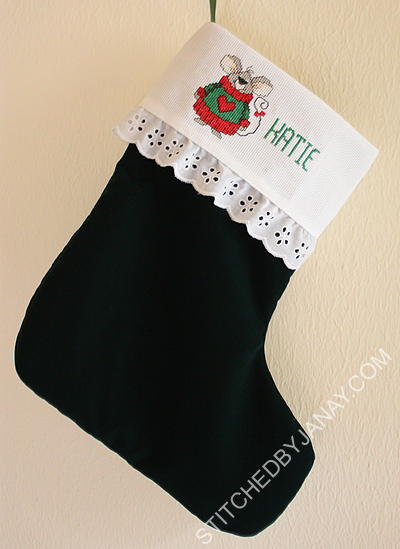 I was pretty pleased with the results, especially since I have never made a fully lined stocking before! I traced one of the stockings for my pattern and just made up the construction process. 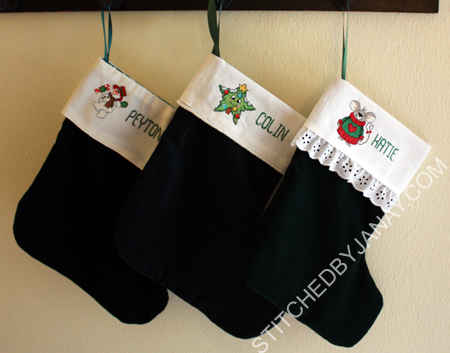 Here are the kids' stockings -- I think Katie's coordinates quite well! 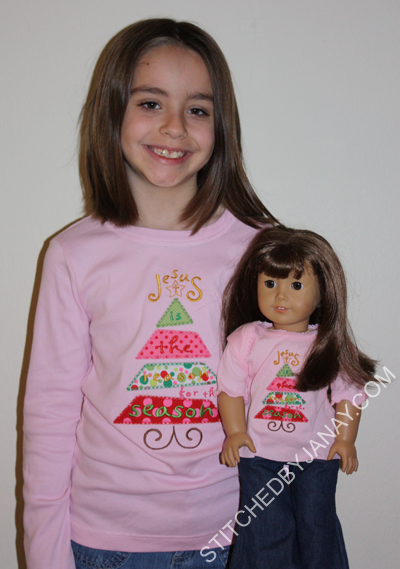 Wednesday evening Annaliese was invited to bring her American Girl doll to Thanksgiving dinner. She asked me if Anna had a turkey shirt. Drat, I thought I had gotten away with not making one. :) I did end up with a bit of free time during nap time, so here's what I whipped up! 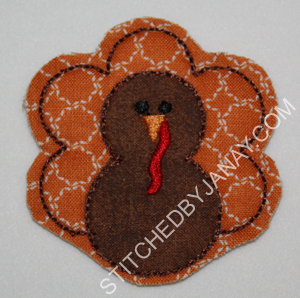 I took the 4x4 size of the applique turkey from the Harvest Patchwork set at Designs by JuJu and reduced it. 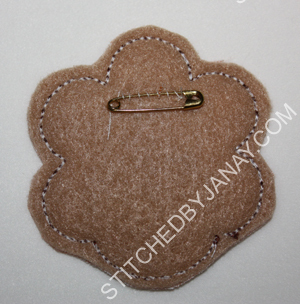 I also deleted the satin stitches to save time. I had scraps from Annaliese's shirt which already had HNBL on it, so it went pretty quickly. The true creativity came in finding a blank. 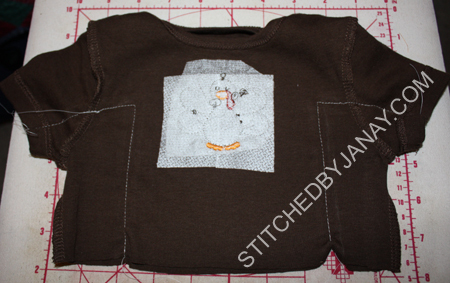 I knew I had a brown onesie in my stash, but discovered it was a short-sleeve 9-12 month size, which is HUGE for a doll. I decided to use it anyway. 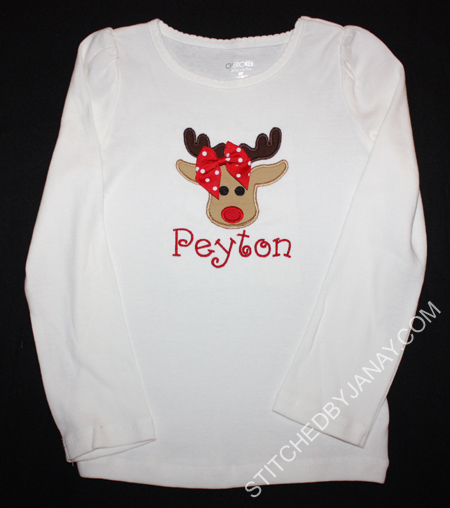 Chopped it off, did the applique, then took in the side seams/sleeves. 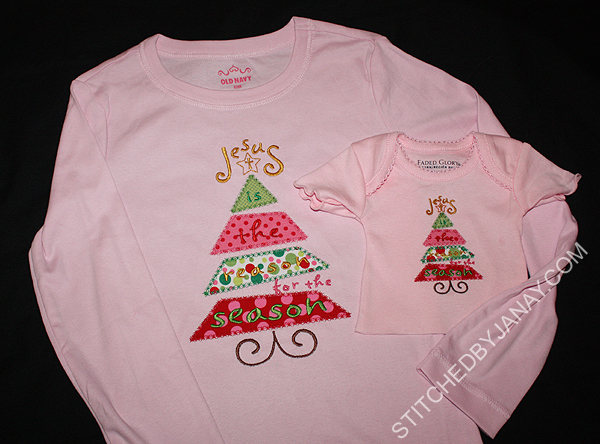 I just laid an AG shirt on top of the onesie, drew in seam lines and stitched. Definitely NOT an exact science! It fit Anna quite well, and bonus, it turned into a long sleeved shirt! Annaliese was quite pleased! 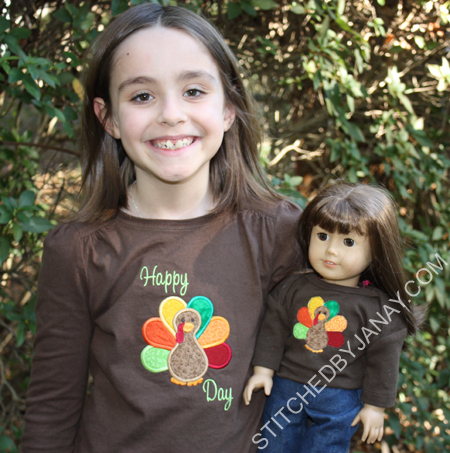 Now I'm hoping Annaliese's turkey shirt still fits her next Thanksgiving so they can match for another year! 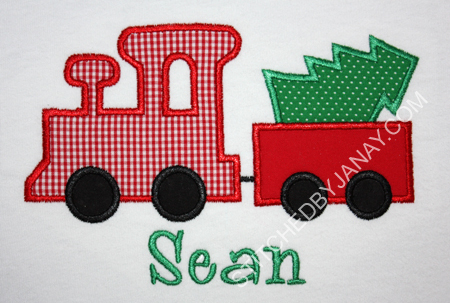 Sean loves trains, so Amy selected Applique Cafe's Christmas Train. I used Whoa Nelly from 8 Claws and a Paw to add his name. 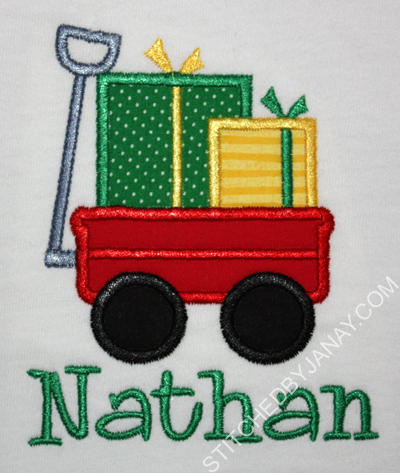 For Nathan we used Planet Applique's Gift Wagon. I love all of PA's little holiday wagon designs. I think I own them all, and this is the first time I've used one! 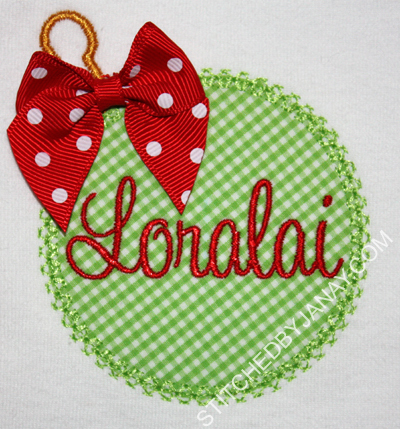 I used Embroidery Boutique's Round Vintage ornament, and Sweet Tarts from 8 Claws and a Paw. LOVE this font! Only my second time using it, so it has to get into the rotation more often. And finally, a shirt for Dashiell. 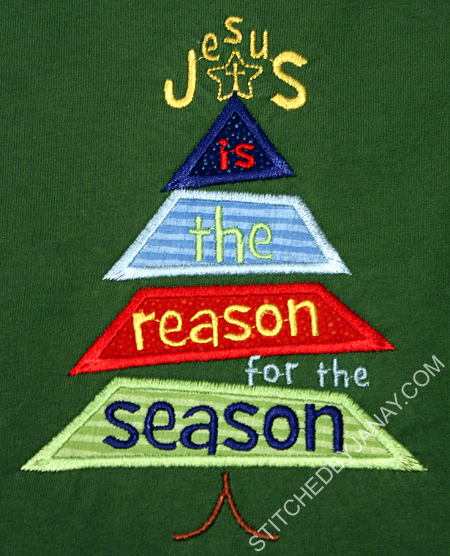 Lynnie Pinnie released another version of the Jesus is the Reason for the Season tree design. 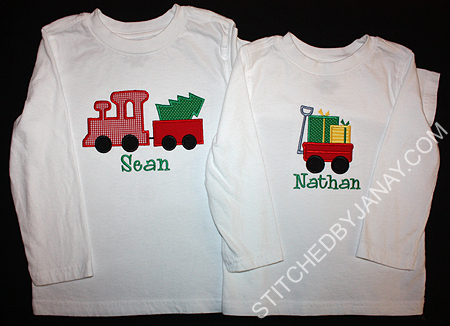 Since I used the more girly version for Annaliese, I thought this would make a great coordinating set of shirts. Eh, this isn't the best picture but you get the gist. I'll take a picture of the kids together in front of our Christmas tree this weekend! 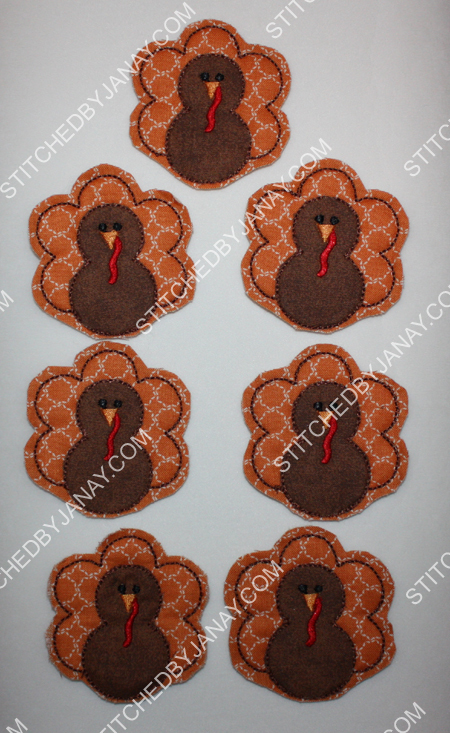 This set of turkey pins was given to our church's preschool staff on behalf of the preschool board. We are so thankful for all they do! The text was requested by my friend. I used Embird Alphabet #14. We selected the colors for the orange shirt to coordinate with a pair of leggings (which I forgot to photograph). 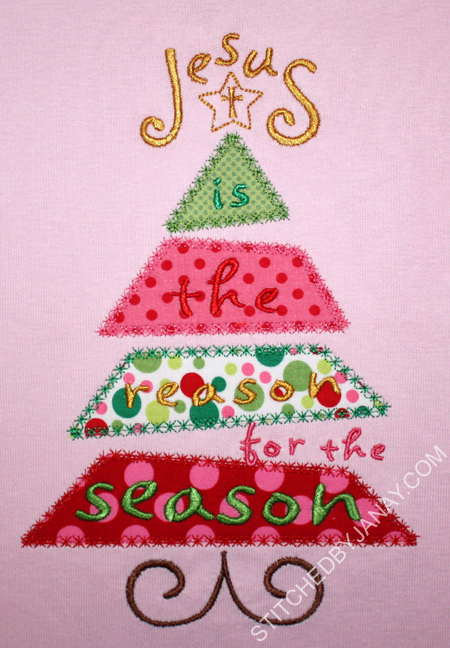 And for obvious reasons we omitted the pink from the other shirt. 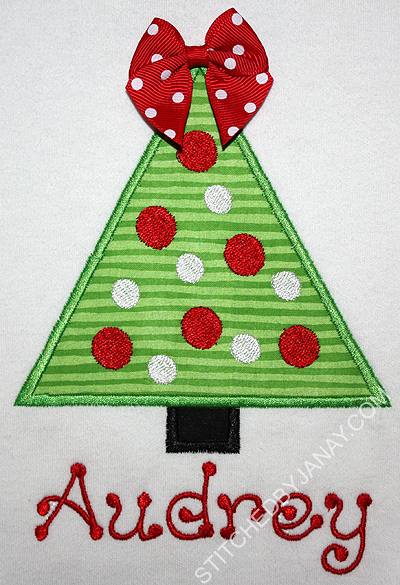 I just love this striped fabric!! I ordered it specifically to use on tie onesies. 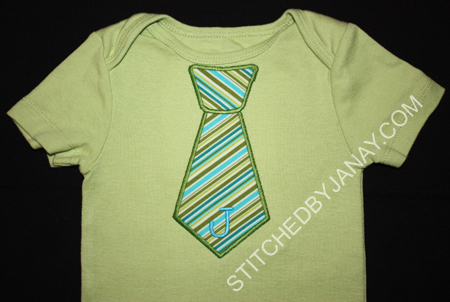 Every time I stitch the Neck Tie Applique from GG Designs I fall in love with it all over again! 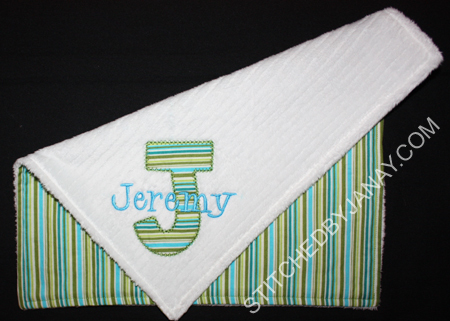 The applique "J" is from Embroidery Boutique's Fun Applique Alphabet, and I added "Jeremy" with Whoa Nelly From 8 Claws and a Paw. 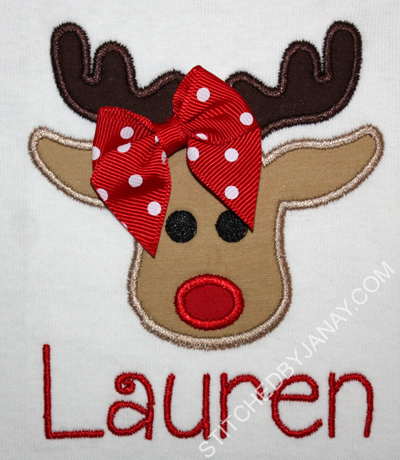 The little lovey blanket has minkee on one side and the striped fabric on the other side. 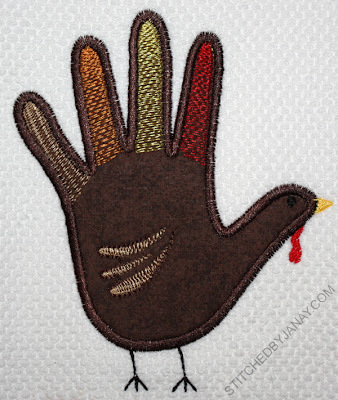 The applique turkey is from the Harvest Patchwork set at Designs by JuJu. I LOVE this turkey. 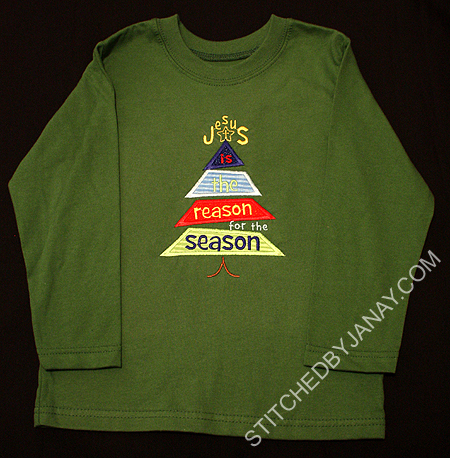 The artwork is so cute and DBJJ designs always stitch so nicely. Annaliese and I had fun picking out fabrics together (which honestly is no easy task -- she has much looser guidelines for what colors go together than I do). We are both thrilled with the results. 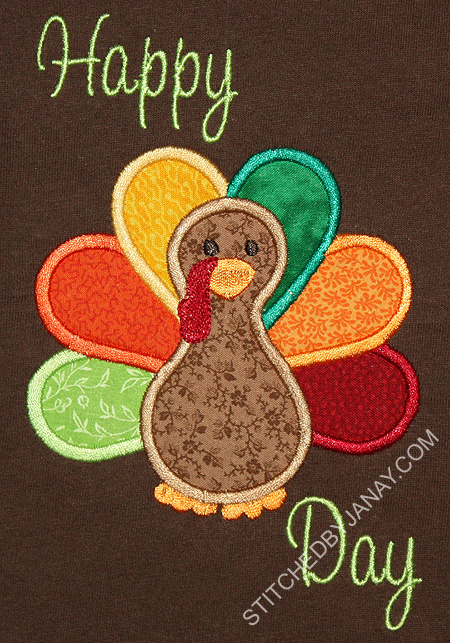 Per her request I added "Happy" on top and "Day" on bottom so it reads Happy Turkey Day. 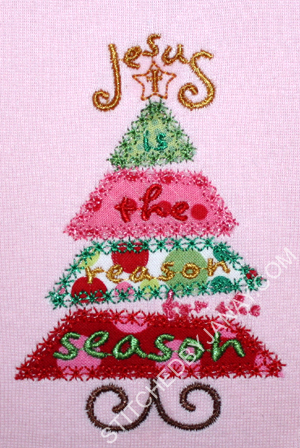 I used the Sweet Tarts font from 8 Claws and a Paw, which is just lovely! 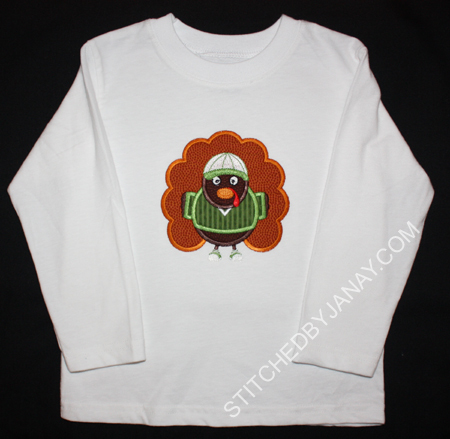 This cute little boy turkey is a new design from Lynnie Pinnie. 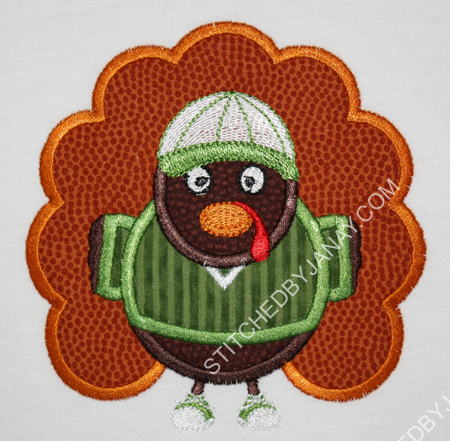 Since he's wearing a ball cap and sneakers I decided to make him real sporty by using my basketball and football texture fabrics (not vinyl, just regular cotton). 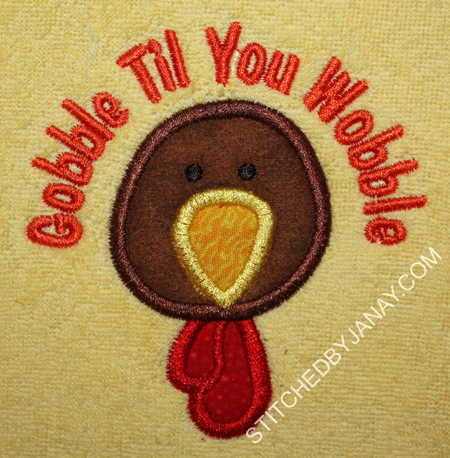 The turkey applique is from Pink Frog Creations. 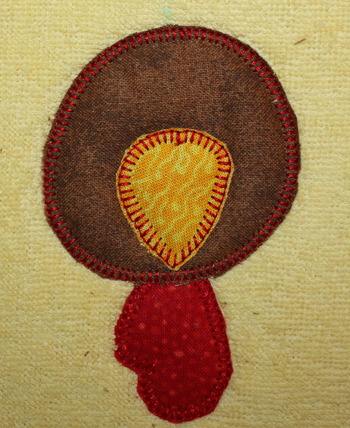 It was my first purchase from this new-to-me digitizer, and it stitched great! (She has a cute owl I'll probably have to add to my stash.) I added the text with Embird Alphabet #18. A few weeks back Laura had "liked" an etsy link that showed up in my Facebook feed... I told her I knew a gal who could make something like that. 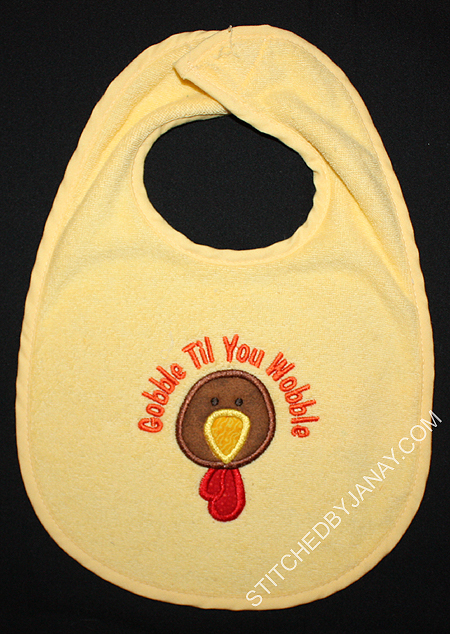 :) I used the same turkey as in the listing, but picked the fabrics from Riley's onesie since it turned out so cute. 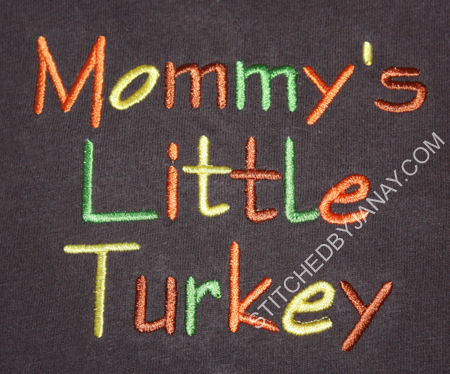 This turkey is from Embroidery Boutique. 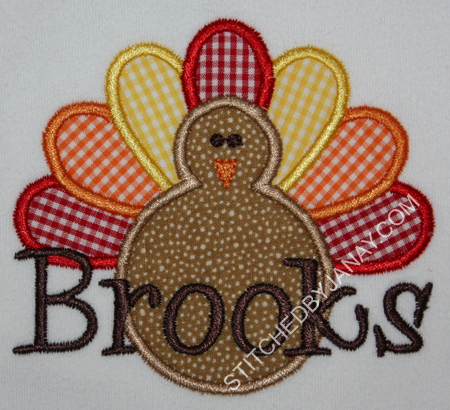 I added "Brooks" with Whoa Nelly from 8 Claws and a Paw. Speaking of 8CP, they have been releasing new designs like CRAZY recently! 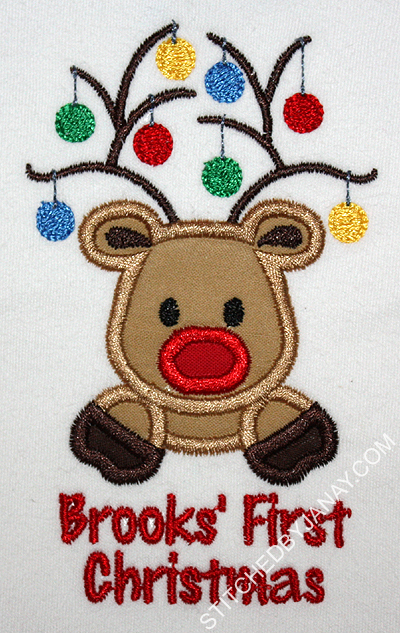 I decided to stitch this little guy on a bib because I thought it was such a sweet face. 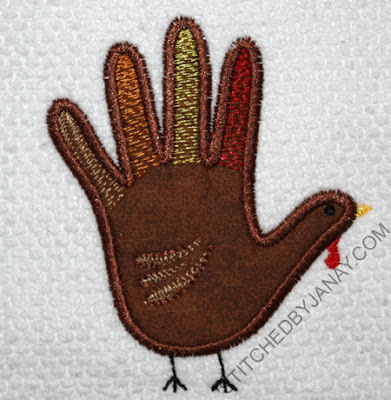 Dashiell gave his teacher the towel using the 4x4" Hand Turkey applique design from LP. 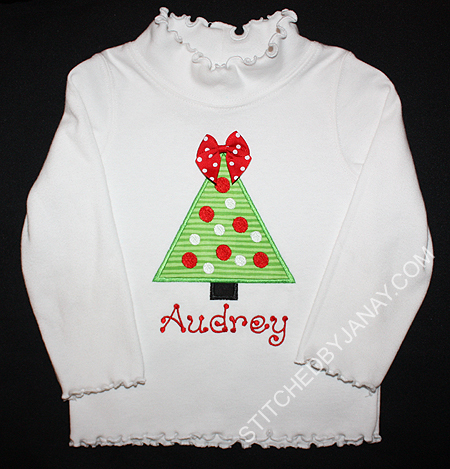 The font is "Andy" and Kathy digitized it for me a couple years ago. 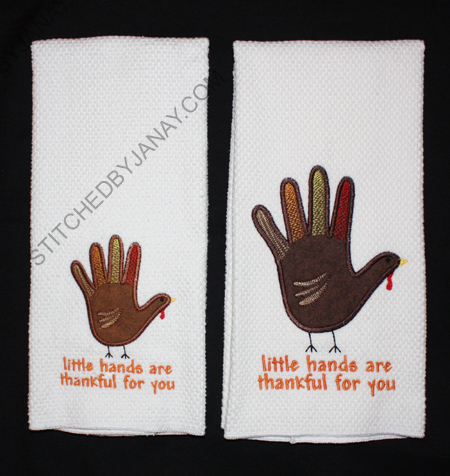 Annaliese gave her teacher the towel using the 5x7" design. Whew! And with that, I think I'm done with turkeys for 2011!